More evil. And, even more evil. That’s how much vengeance-praying King David is doing in this psalm. I know it is an “imprecatory psalm.”  But, I did not realize how many horrible things David was praying in this psalm. I need to sit back and take a long breath. God, I am reminded again that Your righteousness has been fulfilled by the cross of Christ. And, it is only through His death on the cross that I can even lift my head above the ground in anything less that abject guilt and shame. It is then I experience what Isaiah experienced in the temple, in the sixth chapter of his book. The angel flies to me with the coal of holy fire and burns my sin away, too. Lord, here am I.
 Meditating on the Word, Dietrich Bonhöffer, edited by David McI. Gracie. (Cambridge, Massachusetts: Cowley Publications, 2000, 82. Ash Wednesday. I prepared ashes for the congregation. I taught bible study this morning—on peace. And, I finished the sermon (shorter meditation, really) for this evening. Sermon on Psalm 51. On iniquity, transgression, and sin. On God’s forgiveness and mercy. As I mentioned in my meditation, understanding our sin (and sinfulness) prepares us to receive the forgiveness that comes through Jesus Christ. And, yes. Each person in the service this evening who wished received the cross of ashes on their forehead. I have also been thinking about the Pursuing PEACE Project. My personal journey around the Chicago area, asking people about their individual definition of peace. I am honing the information I will present. I want to be open to the individual stories, listening with an open heart. However, the concepts of peace, forgiveness and mercy are becoming combined in my mind. If you like, what young people might call a mash-up. Sprinkle with honesty and openness. Season with genuineness and willingness to understand. That is what I am going to try to do in this Lenten season. Yes, I still have the cross of ashes on my forehead. Yes, I thank God that I have peace with God through Jesus Christ. And, yes, I very much wish to see what other people have in their minds and hearts concerning peace. I will close this penitential blog post with a prayer from my blogging friend, Rev. Bosco Peters (http://liturgy.co.nz). Through the cross of Christ, God have mercy on you, pardon you and set you free. Know that you are forgiven and be at PEACE. God strengthen you in all goodness and keep you in life eternal. Amen. I have about 17 days until Lent begins, with Ash Wednesday. So—what to do? How should I pray each day, in these last days of the Epiphany season? I turn to a book that holds one of my preferred ways of looking at the world—the Myers-Briggs type indicator (MBTI). This is a personality type and preference indicator, measuring both the way I view myself and the interior life, and the way I view others and the exterior life. This book is called Prayer and Temperament, by Chester Michael and Marie Norrisey. It does a good job of showing the close connection and preference for different types of prayer, according to the Myers-Briggs preference classifications. Unfamiliar with the MBTI? Don’t be too concerned. This particular way of praying, called Lectio Divina, is an ancient method. Different types of people prefer different ways of praying. Using the MBTI, the authors try to show how variations in methods of prayer can be more effective with, say, an introverted person who likes to focus on thinking and intellectual pursuits, as opposed to an extrovert who loves to express feelings freely. 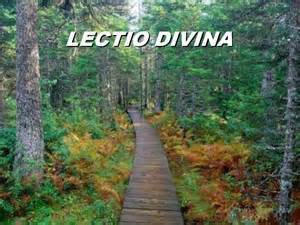 Let’s look at Lectio Divina, first. A Benedictine method of prayer, it’s been in existence since at least the fourth or fifth centuries. It has four steps: lectio (reading using the senses), meditatio (thinking/the intellect), oratio (feeling/personalization) and contemplation (quiet listening/ intuition). I’m going to concentrate on Galatians 6:14. In step one, I am drawn to the phrase “the world has been crucified to me.” With step two, I ruminate about this phrase—even word—from the verse. Focus, and try to pick it apart. Oratio? I try to find how it is applicable to me. Hmm. My understanding is that the world (or, things sinful and not pleasing to God) is supposed to have little effect on me. I must be boastful and prideful in _only_ the cross of Christ, since I put my faith in it. Fourth, I contemplate. The cross separates me from things of this world, things that can separate me from God, and orients me toward Christ. Toward how the seductive world can be just a dream, even a nightmare. So—I will be following the four simple steps of Lectio Divina for the next two weeks, until Ash Wednesday arrives. With a reminder, the results of the Myers-Briggs test are fascinating, and enlightening. This book shows how these versatile methods in prayer can be best used, no matter what way the mind functions, no matter which type is my preference. Ready for an indepth look at God’s word? In prayer?